King Felipe and Queen Letizia paid a State Visit to Japan from April 4-7. They arrived in Japan on April 4 and were greeted by the Deputy Foreign Minister and ambassadors, before meeting with Emperor Akihito and Empress Michiko on April 5. For the day meeting, Letizia wore a red outfit from Felipe Varela which consisted of a velvet dress with buttons and a bow at the neck and a coat with two ties. Letizia’s ruby and diamond earrings were a loan from Queen Sofia. Letiza’s pumps are from Lodi and her clutch is also Felipe Varela. The outfit is very pretty if you ignore all the buttons and ties. In the evening of April 5, there was a State Banquet at the Imperial Palace. The Emperor and King double and tripled up their Orders for the evening. 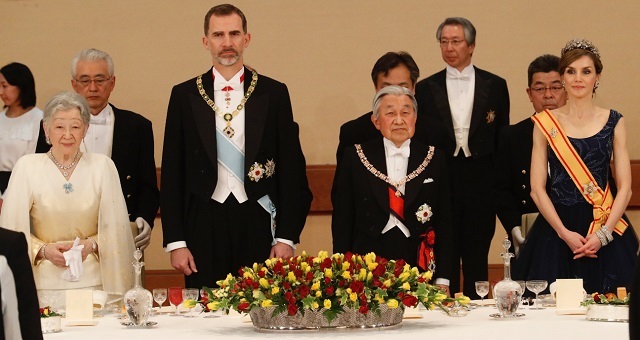 The Emperor wore the collar of the Order of the Golden Fleece (Spain) and the sash and star of the Order of the Chrysanthemum (Japan). The King wore the collar and star of the Order of the Chrysanthemum (Japan), the sash and star of the Order of Charles III (Spain), and the neck badge of the Order of the Golden Fleece (Spain). The Empress wore the small bow brooch of the Order of Charles III (Spain) under the v-neck of her dress. The Queen wore the sash and star of the Order of the Precious Crown (Japan). Letizia repeated a Felipe Varela midnight blue tulle ballgown embroidered with crystals in the shapes of leaves that she previously wore to a State Visit from Peru in July 2015. She wore her favorite Spanish Floral Tiara, the two large “joyas de pasar” diamond bracelets she wore to the State Visit from Argentina in February, a diamond fleur de lys brooch, and sapphire and diamond earrings borrowed from Queen Sofia. On April 9, Prince Charles, Prince William, and Prince Harry joined French President Francois Hollande and Canadian Prime Minister Justin Trudeau at the 100th anniversary commemorative service at the Canadian National Vimy Memorial in Vimy, France. The Battle Of Vimy Ridge was fought primarily as part of the Battle of Arras during the First World War. The British-led offensive was mostly fought by the Canadian Corps. Princess Beatrice attended the WE Day New York Welcome to celebrate young people changing the world at Radio City Music Hall on April 6. She clearly spoke on stage, but I haven’t found any information about what she spoke about. On a superficial note, her purple dress is cute. If you would like to help Iris out, you can find her fundraiser page here. Crown Princess Victoria has been out and about. On April 6, Victoria attended a foreign relations committee meeting at the Royal Palace. On April 7, Victoria attended a meeting with the President of Vietnam Nguyễn Thị Kim Ngân. Also on April 6, Victoria and Prince Daniel visited SVT. It’s adorable that Daniel has a photo of Estelle on his phone case, but maybe he should get a new one with a pic of both kids? On Friday, April 7, there was an attack in Stockholm when a lorry was hijacked and driven into a store, killing four people – two Swedish, one Belgian, and one British. A further 15 people were injured in the attack. Letizia it’s a very beautiful woman. I am not a fan of her red outfit though. All the buttons and ties. Too much for me. Also I feel velvet is a little too heavy of a fabric for spring. Her evening look is divine. I’ve always been a fan of the flowery tiaras. I have to say that I am so happy that it seems as though William and Harry finally are wearing suits that fit! Maybe Charles sat them down and said he won’t be seen with them unless they get properly tailored suits. Speaking of Charles, he wore a very light colored suit. Was that appropriate? I am asking because it made him stand out as all the other men wore dark colored suits. Beatrice looks great in that purple dress! I don’t know if she’s lost weight recently or if that dress just really works on her. Those shoes though are something else! It looks like she’s going to topple over any second! I appreciate her risk taking though. Victoria did such a great job this week with her message of unity. All the victims of the recent terrorist attacks are in my thoughts and prayers. Hopefully one day we will live in a world where things like that no longer happen. Very strange that Charles wore that light coloured suit – unless he is following some sort of personal protocol like “It’s April, I’m changing it up to my summer suits!”?? Charles wears light colored suits regularly. So I don’t like it’s strange that he wore a light colored suit. I meant more if a light colored suit was appropriate for this particular occasion, since it was a memorial service, not him wearing light grey suits in general. I was asking because I noticed all the other men wore dark colored suits. I think grey looks good on Charles, it suits him.He looks always really elegant. Charles always looks dapper! That’s why I never understood why his sons always look so bad. Clearly they have the means to look dapper as well. William usually wears pants that are way too tight, and Harry usually wears things way too baggy and often wrinkled. They both seem to be making an effort with their appearance as of late. Ugh, William and his tight pants. Maybe Kate has been a bad influence on him and that is his way of flashing. So beautifully said. Victoria shows so much respect. This brought tears to my eyes, also seeing how distraught she was. Miles away from the BRF and their impersonal statements. Heartfelt, genuine and unyielding in her response: excellent. On another note, Beatrice looks fresh; those boots – wow! Hasn’t she just started a new job somewhere? I believe I saw somewhere that she’s now a VP of some sort at a tech firm in NY. Funny how she and I are the same age and she’s already a VP!! It’s wonderful to know another future monarch is warm caring for humanity (as if a King Henry) strong, and her Consort Prince Daniel seems to be helping her with her role. Reminds us of QEll and DoE. Compare to whiny in that second frame withthe Wales and his face with the look of hate not around middletons enablers. He must have been ordered to be present with just the three. A nice nod to Prince Henry Invictus with Canada PM. Princess Bea was great in control. And Queen Letty always regal and dignified as is the Emporer/ss. Hi, Cathy. I agree with you. That is the first thing I came away with when reading this post. And, it was the last thing in the post. Bless all the people in Sweden. Victoria did everything perfectly–laying roses at the site, showing her feelings and her response was perfect and pointed. I loved it when she said “Together.” Also, she has a beautiful voice. She showed real strength through her compassion. I hope Sweden is proud of Victoria. I thought she handled that beautifully. I’m totally impressed by Empress Michiko’s clothes, they have such a simple, but elegant cut. The pictures of Victoria are strong, she can handle such situations like a royal should, she will be a great queen. I love the Japanese royals. Masako is brilliant, Harvard educated, and worked as a diplomat before her marriage into the royal family. 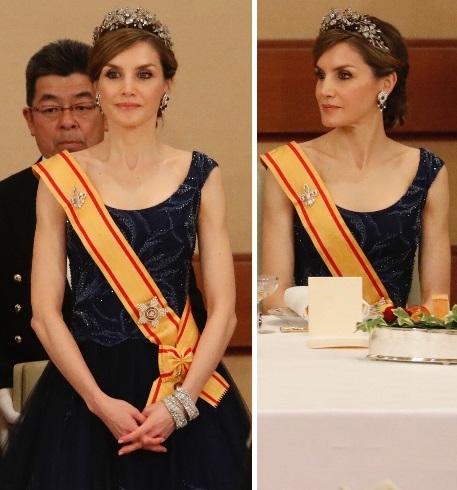 Queen Letizia’s fleur-de-lys brooch comes from her Ansorena tiara. It was clever of them to design it like an historic tiara, with pieces that come out as brooches. She wore that pin for years before the tiara came out in public. I’m still not fond of that anniversary tiara itself, though. There are few modern tiaras that I like (Midnight! ), and several that I think fail (this one, Marie’s silver lily one). Glad to see Will walking with Trudeau – the only photos I saw elsewhere were nice ones of Harry engaged in conversation walking with Trudeau and I thought it was odd as Will had obviously spent time in Canada and should be on really friendly terms with him too. And these are the types of suits they guys should wear – nice fit, looks very sharp. We often complain about Kate’s alterations, but Will and Harry are often guilty too of poor fit. KP needs a good tailor. Thanks for posting on the other royals, always nice to see! Yes, Very strange – Just goes to show who should be the heir to the heir. A lot of whiny Canada visit had few photos with the PM and his regl wife. Prince Harry is taken much more serious and dutiful with Greater respect. It’s also a nod to Meghan as Canada was her home for a time, Invictus and Harry’s visits. Beautiful SRF done it agai – they held a moment of silence for the victims and Sweden! Letizia looks amazing and I like how she engages with the people she is meeting. CP Victoria is widely admired and for a reason. She was very inspiring and spoke from the heart, the Swedish people are lucky to have her. Am I the only one who didn’t like what Bea wore? Ugh! Just that. Ugh! And, the young woman who writes the blog needs some financial support? Couldn’t Bea help out? I mean, really! I wish the woman well. She is working hard and under the burdens of an illness. She deserves the best. Leti continues to amaze me with her elegance and beauty. She is a very put together and savvy woman. The Empress is elegant and so stylish, too. Victoria? I commented above. She is a caring and dear woman who will be a great Queen. The person who writes the blog is a Beatrice fan, not someone who is hired by Beatrice to write the Bea-friendly blog. Would be seen as very self-serving if Beatrice funded a trip for someone who voluntarily writes pro-Beatrice things. If Bea finds out about the appeal, she could choose to fund it anonymously. But if a large anon donation came in, many people would assume (positive-or-negative) things about Beatrice and that blog from now on. Beatrice would be accused of paying for good PR, etc. I understand, notasugarhere. I guess I should have said an anonymous donation. I was a bit put out that the woman was asking for such help. I do wish her well, but there are plenty of other things I would donate to and I think Bea could definitely help with an anonymous donation. The woman seems most sincere, but truly, I think it was rather bold to ask. That’s just me. I guess the people who love her blog will help her. That would be nice. I understand that, but please be nice to Iris. She asked me to include a link to her fundraiser page so I did. If you don’t want to donate then you don’t have to. No, you are not hte only one, Jenny. I did not like Bea’s outfit, either. She looked like a teenager. Of course, she was speaking about young people and probably trying to appeal to them, but she looked like she stepped off the pages of a teen magazine. She could still look smart and up-to-date without looking so childish, imo. Did like her boots, however. I also wondered if Bea could make an anonymous donation. I think the young woman was very earnest in her request and must work very hard, but I think I was also a bit put out by her request for funding for the trip. Perhaps, as said, those who frequent the blog will help, but for goodness sake, I wonder what is happening to the world that people just out and out ask — especially, when it is not during a moment of medical emergency. I wish the woman the best, but frankly, I was a bit surprised by the request for financial help when there are so many more dire situations in the world. To each her own, however. If you don’t ask for help, I guess you don’t get it. It was a rather youthful look, but I think she pulled it off. I understand your opinion, but please be nice to Iris. I don’t want her to get sh-t on because I made a decision to help publicize her fundraiser page. I think what’s so off putting about the donation request is it’s becuase she’s asking money for souvenirs. I didn’t like Bea’s outfit either. Iris doesn’t know Beatrice personally, she just writes a blog about her. What are the orders charles and Harry have over their ties and why hasn’t william got one? Anyone know? I think Harry’s is his Royal Victoria Order. William isn’t wearing either of those because he hasn’t been awarded either of those. I was trying to figure out if it was boredom or a very sniffy, “I am above this you plebs” simpering look. Harry is looking in the same direction with a curious or concerned look, Charles looking the other way. So many things to comment on here. Thank you for a great post, KMR. I thought Leti was magnificent in her evening attire. Just stunning. The Empress is also quite an elegant woman! I did like the red coat and dress, but see what others mean about the ties and buttons. Leti serves her people well. She is so on top of her game. Just lovely in so many ways. Victoria? How I admire her. A loving wife and mother and a dear and admirable future Queen. I also loved her comment when asked how Sweden would move forward. “Together.” Amen, Vic. Beatrice looked a bit teen-like to me in that get up. The color wowed me and I liked the concept of the dress, but how short! I mean, a bit longer and ok. I did like her boots. I think I was a bit put out by the blogger’s asking for financial help, too. I am searching my mind to see what my biggest issue with that is. I really wish her well, but somehow that request bothered me. Go, figure. Charles, Harry and William? Well PC and PH looked very dapper and so intrigued by what they were experiencing. I know we have discussed William’s facial expression before, but, darn if he doesn’t look bored, put out and stuck up so many times. I am still amazed by what a cute child and teen — and younger man — that he was and now! Yikes, he just smacks of a stick in the mud. (Except when he’s Dad dancing, that is)! Just walking in those trenches would have sent chills through me The history, the braveness of the men who served. I think Harry and Charles got that. If William did, it surely didn’t show on his face. Sorry to bring that up again. I think my issue with the blogger’s request was that she already was given free airfare and hotel, which is not cheap. To ask for money for food and souvenirs on top of that seems like she is looking for an entirely free ride. The blogger comments on KMR from time to time, so I think KMR is trying to help her by including information about her crowd sourcing efforts toward funding a small part of he cost of the London trip. I understand about the fundraiser request, but I’m the one who made the decision to include the link here. If you have a problem with it, please direct it toward me, not Iris. I see that PHarry has more medals to wear than PWilliam, lol. Anyone know what the medals mean? I also see PHarry wearing a necklace with a medal, cool. That last picture of PCharles and his sons you can see the resemblance between PCharles and PHarry, wow. Two of the medals Harry wears are the same ones William’s wears – Queen’s Diamond Jubilee medal and Queen’s Golden Jubilee medal. The third is his medal for military service in Afghanistan. The “necklace medal” is because Harry was Knighted as a member of the Royal Victorian Order and William was not. I know, it has nothing to do with this post, but I sometimes miss the old days without the Middletons, William seemed far more relaxed. Perhaps he really never wanted to marry but was forced to and perhaps he never wants to become king. I just can’t come over his bored expressions, his lack of enthusiasm for his tasks. I don’t think the Middletons help with their own lack of interest in others and eagerness to please him. Looks like we’re going to get new pictures of George and Charlotte soon. Kate, William and Harry will attend the wedding while George will be a page boy and Charlotte a bridesmaid. The wedding will be on May 20th. Isn’t the wedding supposed to be private ? Why KP is even commenting ? Agree, Sarah. The kids will upstage Pips. Carole, Pips and KM release conflicting information and it’s effect is to realize they are publicity goons. A private wedding but we have the Camb kids. Royals in the line up of weddings of private citizens is not something new. The Palace announcing it officially is unprecedented and as Dickie Arbiter said, wierd. In effect, the Palace is releasing private information about private citizens whom they’d previously and consistently refused to comment or help in an official capacity in the past. So do we thank the publicist for finding a roundabout way to release the information rather than releasing it through usual DM drivel? This way absolves the Midds from accusations of using their royal connections. Also does anyone think that recent Carole-lackey interlopers have been scoping out KM related blogs and testily challenging the prevailing opinion that the Midds are grifters? It seemed the commenter last week or the week before was interested in sowing confusion. And so officious. I noticed that the video of W yelling at KM is missing. The Carole lackeys had it removed, and felt justified in saying it never happened because there was no video. The gaslighting that goes on with the Midds and their reps–I guess they get paid enough to lie through their teeth without any qualms. The issue being that this is a private wedding that happens to have royalty atrending or taking part. Wedding on private estate including church and reception therefore to be treated as a private event NOT a public event, so why is KP treating a private event like it’s a public event? And why is KP talking about Pippa at all when their usual stance has always been that she’s a private citizen and they don’t comment on hrr activities. While i’m here, can i point out the poor grammer of that press release. Wrong sentence construction and poor grammer for a formal notice. Clearly education was wasted on these people. Will that be cheque, cash or credit? And they misspelled “Middleton”, Bawahahahaha!!! I love Peter Hunt’s snark! Also what was the point of hiring a PR person if they were going to get KP to release things officially? Let me guess. Instead of just the RPOs that would be required when W&K and kids attend a wedding? This will somehow end up being the lead up to taxpayer-funded security securing the entire property and wedding reception. They did it with her book appearances, why not this too? I also expect a flyover ban to be magically approved. +1 The Midds will find any excuse to grift from the royal connection. I don’t doubt one little bit that tax-payer security will be securing the entire Bucklebury grounds for days before the private event, because we know that William and Kate will be spending at least one night (and probably more) before the wedding at Bucklebury. Or maybe the Middletons have demanded that the local police force bear the burden. Either way, it’s the public that will pay the price. Of course it will. They spend, what ,a million pounds PER DAY on security every time Kate runs to her mother in Bucklebury…which is why I’d rather Carole at Anmer than wasting money at Bucklebury Manor. Given the choice? I’d say Her Majesty would prefer not to have Carole Middleton lording it over everyone on HM’s private property (Sandringham and Anmer). I dont have the PR knowledge or experience to comment on this, but even to me it seems bizarre. I do have a problem with tbe timing of such frivolous announcements, on the day the courageous policeman who gave his life defending Parliament is burried. Could they not wait and do it tomorrow? Actually, the day the brave policeman is buried is perfect day to release news that might be controversial. Perfeft distraction because no one is paying attention or attention to details. WK probably not factor in such things as they think they are above such things, but the new professional publicist would know. Yes, Daisy. That they posted on this day crosses the line. Carole and Pips are unfeeling degenerates. Why the hell is Harry forced into going? He barely knows these people. Heck he barely knows Kate! The Middletons using KP PR mouthpiece for this is so grasping and obvious! Taxpayer paid royal PR pushing a wedding of a private citizen! I doubt Harry is being forced into going. Both Wales boys never do anything they don’t want to do. Besides it’s a wedding, not manual labor. Harry barely knows them. Why go? Because the middletons invited him per their idea of being royal themselves? More likely, he’s going at the behest of William and/or Kate. If he didn’t want to go, he would have had an excuse of some event planned elsewhere, or just said no. Meh. His choice. I’d rather watch paint dry. Maybe it’s Harry chance to hang out with his niece and nephew. Otherwise I don’t see why he would want to go. He doesn’t have any friends in common that we know of. Meghan will be in Toronto filming so the whole issue of her going will be moot. I can see arm twisting being involved, because William is well-aware that the Middletons are disliked and that Harry was in the anti-Kate The Limpet Middleton. Harry doesn’t know them, isn’t friends with the Middletons or Pippa/James Matthew. I see this as the latest game like the Christmas football a year or two ago. William pretending to have a sprained ankle and sending James Middleton in his place for a game that traditionally has the two royal brothers. Sneaky move on his part to force/make it look like the Middletons are accepted and part of the Real Royal Family. William had no trouble walking on the “sprained” ankle the next day. It’s a shame Harry plays. Or maybe it’s not a big deal either way for him? Personally, I’d resent the hell out being invited just to be another notch on the Middleton’s royal belt. Why the BRF indulges them to the extent they have is ridiculous. Only William is obliged to to consider them, no-one else. I don’t think an official statement by Kensington Palace was the right thing to do here. Wasn’t Harry a page boy at his uncle Charles Spencer’s wedding? Did they make an official statement about that 20 years ago? Or is this just a new thing the royals are doing? Pippa is not a member of the royal family and this is a private wedding. I do not feel it was appropriate for the palace to comment. People are going to react negatively to this because for years people have said the Middletons are social climbing and trying to nudge themselves into the aristocracy and into having titles. This is going to add fuel to the flame. Call me old fashioned, but official statements from the palace should only relate to members of the royal family. Not members of Kate’s, Sophie’s, or any other married in’s family. A statement when a family member passes away or gets married or engaged or has a baby is fine. But the way this statement was worded makes it seem like Pippa is royal or a part of the royal family. We really didn’t need this statement. Considering the Queen’s ex-press secretary is calling this statement wierd and unprecedented, we can assume no. This is WK’s new modernizing way of doing things which probably means that despite this wedding being private, on a private estate that photographers can’t get access to (church and wedding venues), we will get an official pap stroll. Like we did at christmas. I think this is a bad move, PR wise. People bristle when the Middletons cross the line and act too much like they are royalty themselves. Kate is royal now, and so are George and Charlotte, but none of the Middletons are. It almost seems like they are announcing that George and Charlotte are going to be there because they want more cameras and attention. Considering how paranoid William is about his children’s privacy this is very odd. The last time we saw George and Charlotte at Christmas they were with the Middletons and now at this wedding they will be too. Does that mean William only wants the children to be see when they are with the Midds? Anticipating an Easter pap stroll with the kids and Family Middleton next weekend. It is a bad move, if the aim of the PR thrust is to make Pippa more acceptable to the public. More media coverage ≠ acceptance. With weeks to go, almost daily stories are boring the pants off everyone, with Pippa and her noxious family thrust down their throats. And now, KP is releasing information about a private wedding? Would that be the same KP that taxpayers fund? Why is the public paying for press releases for a private citizen, bad grammar and spelling and all? This is not W+K ‘modernising the monarchy’; it is simply out-of-control egotism paid for by mug taxpayers. No doubt further expenses will be incurred with security for ‘royals’ that will also, conveniently, keep the public away, the same public funding them. Jen, you and I think exactly alike: After reading about the KP release, my first thought was that the public are now funding–at least in part–the Middleton’s PR efforts. Clearly, spineless Jason Knauf can’t stand up to the demands of William Middleton and Jo Milloy. Either he’s spineless or just plain stupid–maybe a big heap of both. This is all in aid of elevating the Midds and Willy’s ‘court’, and it has Willy’s fingerprints and middle finger all over it. +1 MA, I just posted similar thoughts before I read your comment. Yes, and a pap stroll a la Christmas for their favored photographers who can come and cover the wedding. I am sure George and Charlotte will look darling. I do find it funny Pippa is being a psuedo royal after all with little ones in the wedding party…Doubt she has any friends to be bridesmaids! I thought it was a British tradition that they always have little children in the bridal party. I remember seeing several weddings W&K attended who had lots of children in the bridal party. No, it’s not really, it’s more a royal thing. It seems like you only announce this if you are wanting the draw attention and the paparazzi to the wedding. The best way to make sure that everyone covers your wedding is to announce George and Charlotte will be in since they are so rarely seen. It would be the first sighting since Christmas so of course everyone wants photos. I know the church is private, but they allowed photographers on the grounds for Christmas, it makes me think they will do the same for Pippa’s wedding. Why else hire a PR company and make it public that the royal children will be in the wedding? Is it true they made a deal with Hello? I read an article that said Pippa did not do a deal with Hello. We should get photos of Charlotte for her 2nd b-day on May 2. Or Easter pap ones this weekend. In the UK, is there genuine public interest in Pippa Middleton to warrant PR expertise and these articles? Or is she simply refusing to leave the stage, waiting for her close-up? Refusing to leave the stage. I am not a fan of Letizia but she impresses me everytime .She definitely has proved her mantle .